The Dow broke below its 60 min triangle yesterday and thus the sell off in the markets. Meanwhile the S&P 500 has slashed through its rising 200 day moving average. 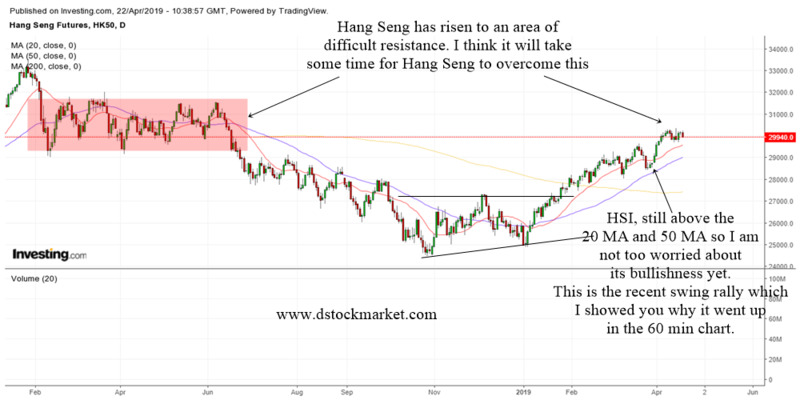 It has not break down and traded below the important 200 MA decisively yet and still might be able to find support there. On the other hand, the Dow is also sitting at its rising 200 day moving average. 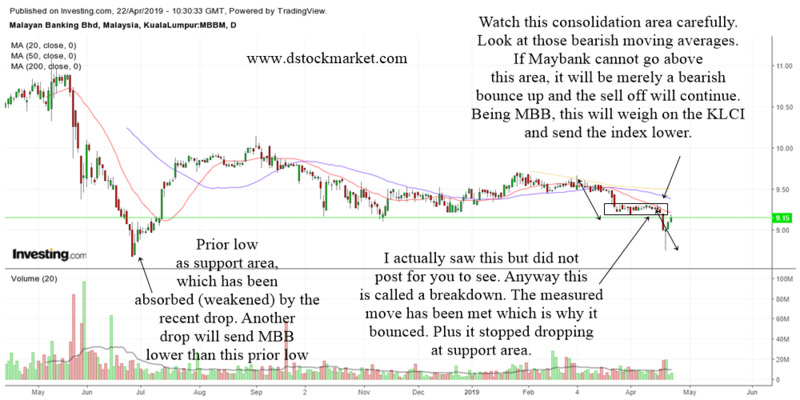 Therefore, we should still be on the lookout if support can hold. It is only when the major indices are trading below this moving average that we should be concern about a bigger sell off. So far, we are still at an important decision point as the major indices hang around the 200 day moving average. 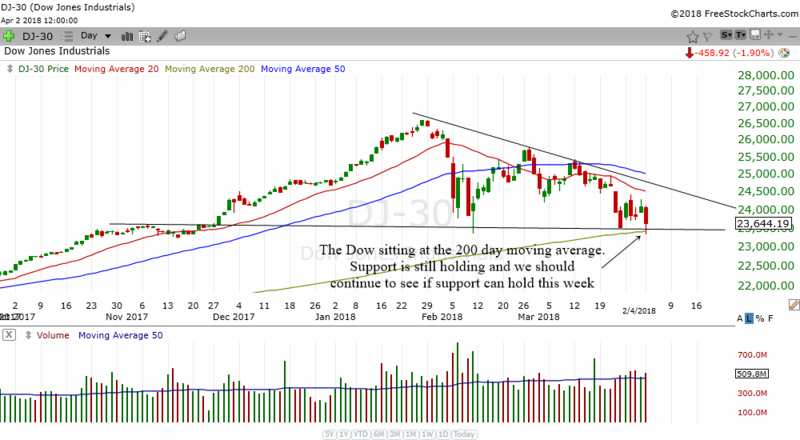 The daily chart of the Dow Jones (not the futures) is sitting at the rising 200 day moving average. It is the first time in a long time since it rested there. 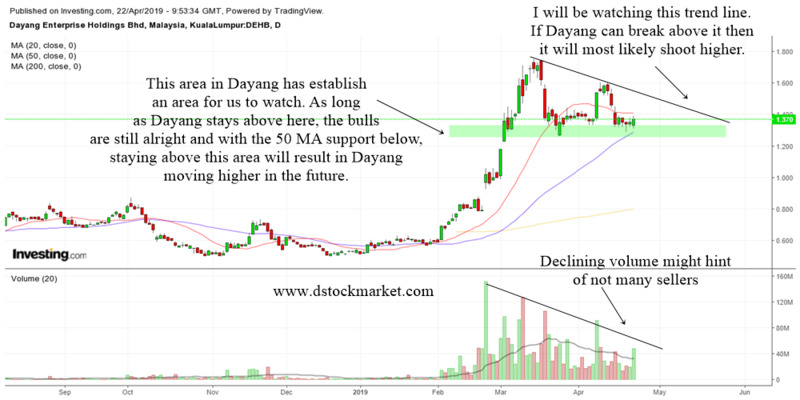 With support at that place as well as the rising 200 MA, let us continue to monitor to see if there can be a bounce up. The downtrend line also looks good. 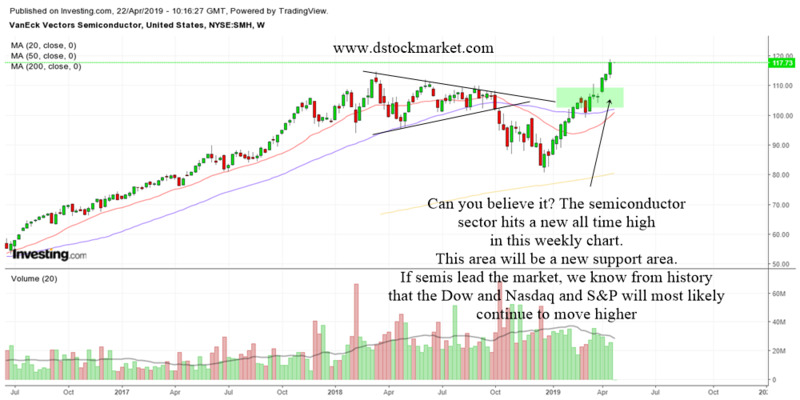 If there can be a bounce up and then a trade above a downtrend line then it will be good for the Dow as we know that the breaking of a downtrend line can signify a change in trend from down to up. Even though we have our ideas in the bigger charts, for trading purposes we should be guided by the 5 min red zones white zones. As you can see, the market gap down into the red zone yesterday and proceeded to sell off. This system that I use is quite effective in helping to tell us what to do. In this case, we should have focused on short selling yesterday. Which I'm sure many experienced traders would be doing. It has traded back above into the white zone and if it stays in the white zone, there might be a bounce up today. 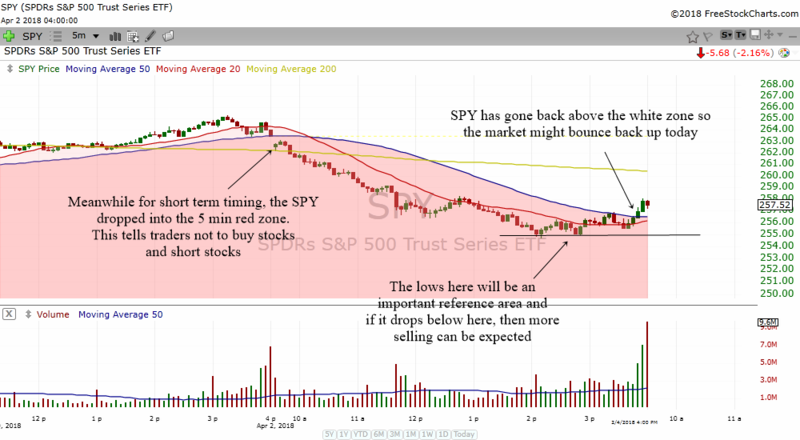 The lows in SPY is also a reference point for us. If prices drop below that low, it will be a signal of weakness and more selling might happen. 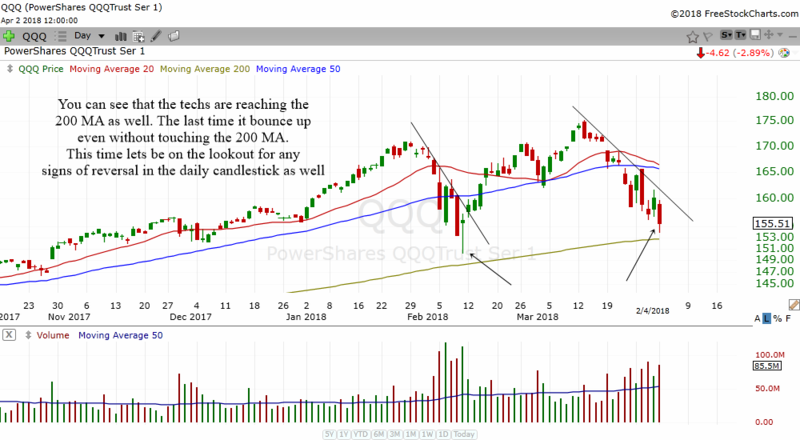 Looking at the big picture in the QQQ, we can see it is also dropping very near to its rising 200 MA. The last time it drop very near to the 200 MA and proceeded to form a bottoming tail and then bounce up. Perhaps this time it might do the same as well. 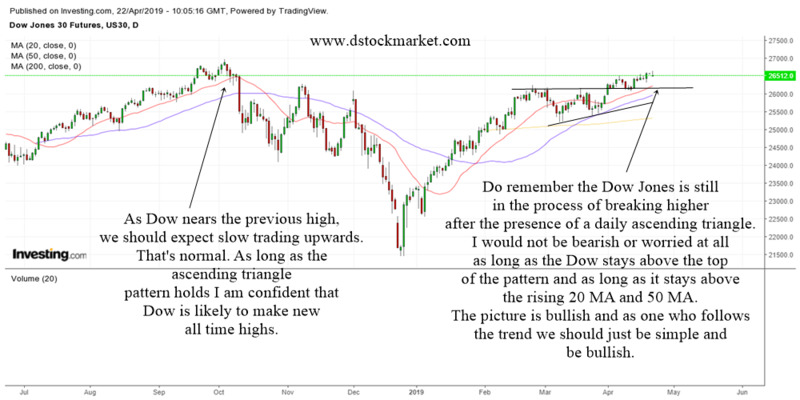 We have to see if it can form a bullish reversal japanese candlestick pattern and break above the trend line I have drawn to have the same bounce up effect like the last one. Otherwise there might be more selling down. Always remember to have a trading plan and follow it.